A clear and compact guide to the Latin language especially designed for both reference and revision. 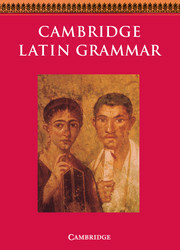 The approach reflects the traditions of the Cambridge Latin Course, but the guide will prove helpful to all students of Latin, whatever course they have followed. This volume represents a straightforward and practical approach to the study of Latin grammar for the contemporary student. Concentrates on basic and commonly encountered language points. Contains a comprehensive index to help students find explanations of Latin inflections and constructions. Includes exercises and practice examples of grammatical points. Useful both to students learning to read Latin and to those learning to compose in Latin.